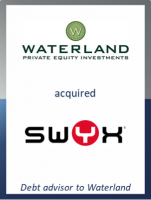 Private equity firm Waterland is committed to enhancing Swyx’s international expansion. "Swyx has a great deal of growth potential, particularly outside Germany. Together with Waterland, we will now be able to exploit this potential," commented Dr Ralf Ebbinghaus, CEO and Co-Founder of Swyx. Waterland already successfully manages various IT companies in its portfolio. "The investment in Swyx is a perfect reflection of our strategy of investing in high-growth, high-quality companies which have a leading position in their sector and want to expand," said Dr Carsten Rahlfs, Partner at Waterland. GCA Altium advised Waterland on all commercial aspects of the financing transaction. Dr Johannes Schmittat, Managing Director at GCA Altium, commented: "Swyx offers an outstanding range of products and is expected to grow strongly over the next years. In addition, the implemented financing structure provides an ideal set-up for add-on acquisitions."